Some portions of the ocean coastline are bombarded by waves, and their sandy beaches are moved and removed day and night. Other beaches have their rocks pounded day and night by waves, and the brief run-up of the waves occurs on very small pebbles that apparently result from the rocks. 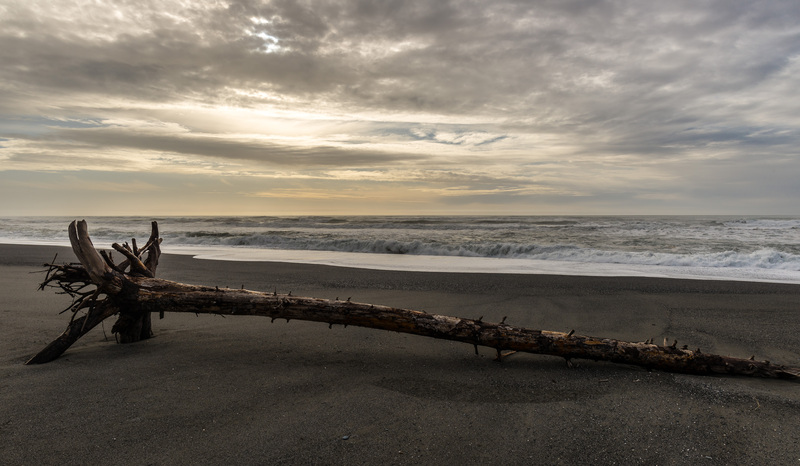 This stretch of beach is generally littered by large logs and trees. I think it’s because Redwood Creek empties into the ocean about a half mile north of here. The creek comes through quite a substantial area of forest, and my guess is that it often carries these trees and logs that have washed out of the woods. They end up stretched out here, along the high tide line.